In the course of Eddie Sung’s distinguished and envious rock photography career, he has had the honour and pleasure of capturing countless Legendary Guitarists – Up Close & sometimes Personal. His trademark B/W images are featured in the CD and Vinyls cover and album artwork of Beach Boys, Blondie, Slipknot and Kitaro. We ask Eddie to single out slowly some of his Highlights and sticky Anecdotes on some of the Guitar Legends that he has had the rare honour of hanging out and photographing. Q – Why Slow Hands and Sticky Fingers? What does the description mean? First of all, this is not an article about Body Massages. Haha. I’ll just briefly mention that Slow Hand is about Eric Clapton whilst Sticky Fingers is associated with Keith Richards. And I’m proud to have photographed both of them! Shot when he was here during his Journeyman tour in the early 90s. That was when he had long hair and decked out in Gianni Versace suits. Even his rhinestone guitar straps were designed by Versace! 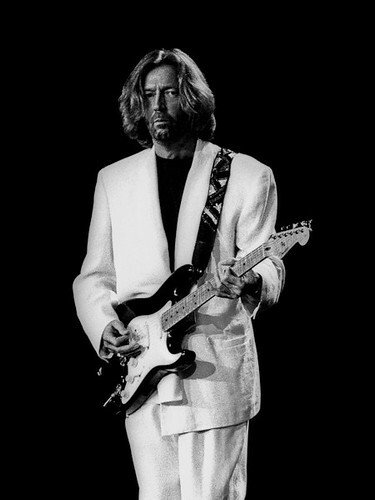 “Slowhand” is Clapton’s nickname. I’m proud to say this image hangs proudly in Singapore’s Hard Rock Café. 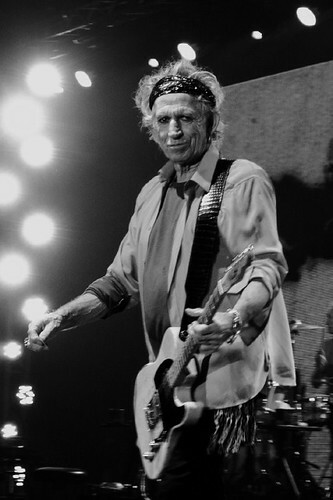 It’s been said, no Keith Richards, no Rolling Stones sound. My favourite Rolling Stones album is Sticky Fingers. The album cover was designed by Andy Warhol. 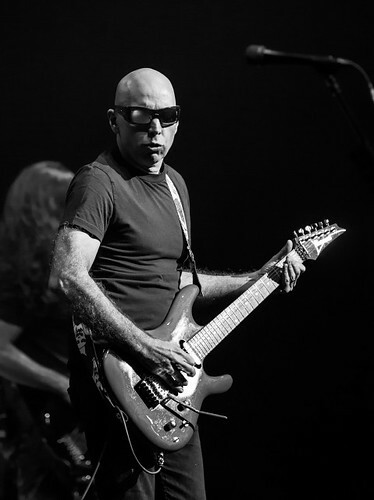 Q – Of the millions of guitarists in this world, why do you gravitate towards these guitarists? I’m fascinated by guitarists and their mastery of their chosen guitar weapons. Masters of their electric instruments. Playing with their own style, like in a flawless intricate dance. They are like in a trance, at One with their instrument of choice. Having done their 1,000,000 Malcolm Gladwell hours! 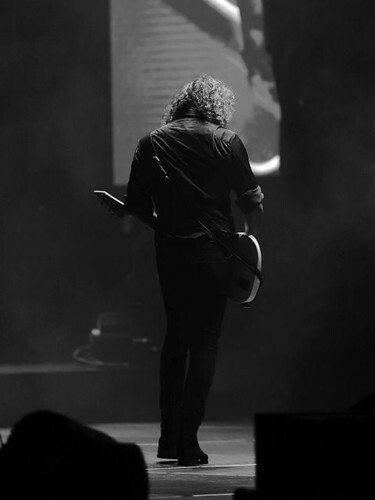 For each of the guitarists, I will say briefly on why they fascinate me. It’s my wish that readers will Google them to read more on their magical guitar gifts and glorious journeys. 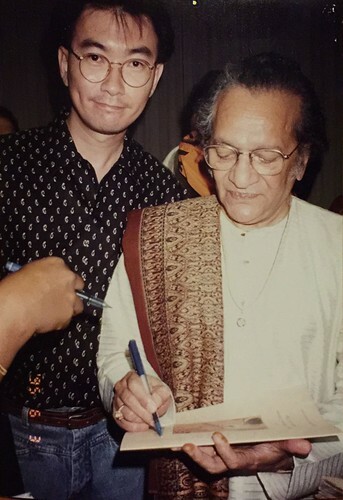 Q – What is the most memorable moments spent with Guitar Legends? I name a few. 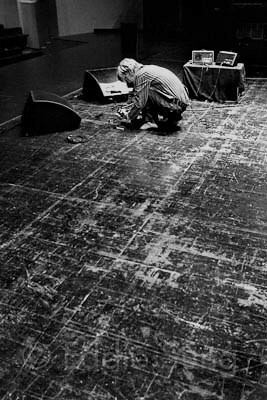 My favourite images are all taken away from the stage. I’ve always said that rock photography is not just about shooting in front of the stage, there’s the backstage, home, studio aspects too. And those are only accorded to the lucky few. The “chosen ones” as I jokingly term it. I had the honour of Roger McGuinn and his wife Camilla visit my home. 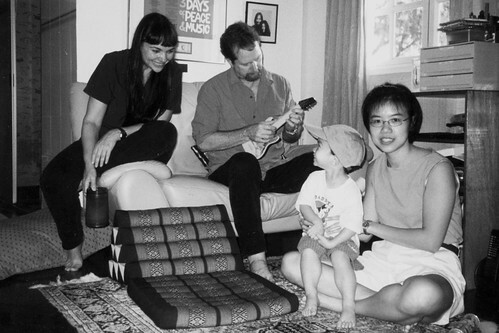 Here, he performed a mini-concert for my family in my music room. I quickly took out my small camera to capture the historical moment. On another visit, he and Camilla hung out at my photo studio/gallery. 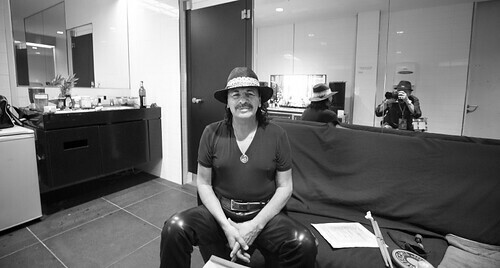 In March this year, I got to hang out with Carlos Santana. I took a playful portrait of him in his green room. The room had a very long mirror, so I thought I’d put myself into the portrait. A story to tell the grandkids about. Hahaha. 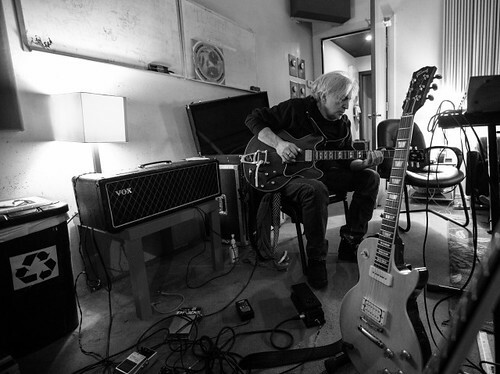 He invited me to hang out (and shoot a few) when Blondie was recording in the Magic Shop studio in New York for their latest album Pollinator. I embedded myself in the cosy studio with them for two weeks. It was all very relaxed. I love this relaxed look of Chris amongst his arsenal of sonic amazement. The cosy Magic Shop was where David Bowie recorded his last two studio albums – Blackstar and The Next Day. 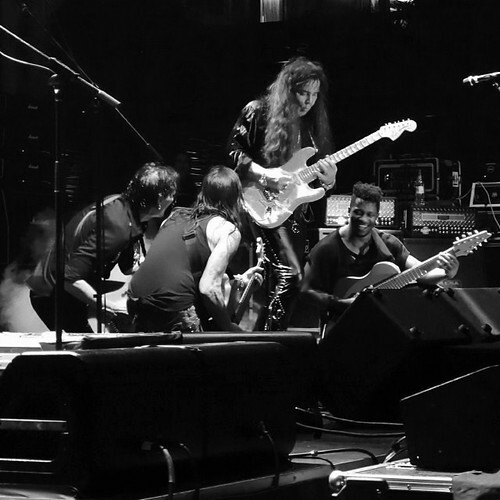 I love this image of Steve Vai, Nuno Bettencourt and Tosin Abasi bowing playfully at the feet of Yngwie Malmsteen. They were at their last stop of their Asian tour. They let loose and had an egoless super-jam and clearly had a lot of fun on stage, with themselves and with the audience. 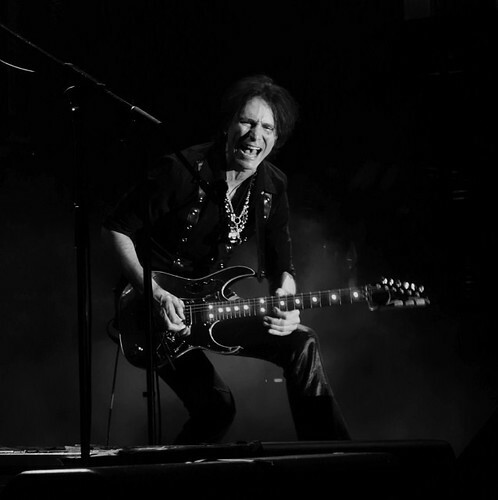 Q – What’s the best way to shoot a guitar god? Any way one likes. 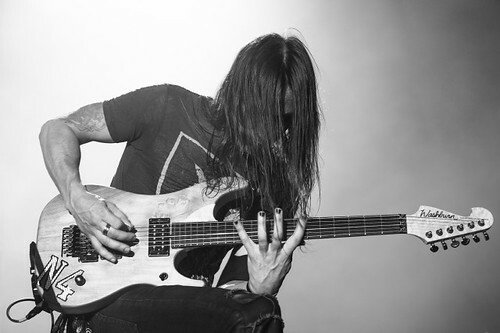 Every guitarist has their own favourite style, angle and posing preference. It’s your personal take on the guitarists. Mine is usually when the subject and I share a visual connection. Eye contact! When the other photographers have shot their first three songs, sometimes I’m the only one left in front of the stage, that’s when the images get intimate and interesting. It’s so great to see them doing their axe magic. Sometimes I just put away my camera and soak in their melodic brilliance. 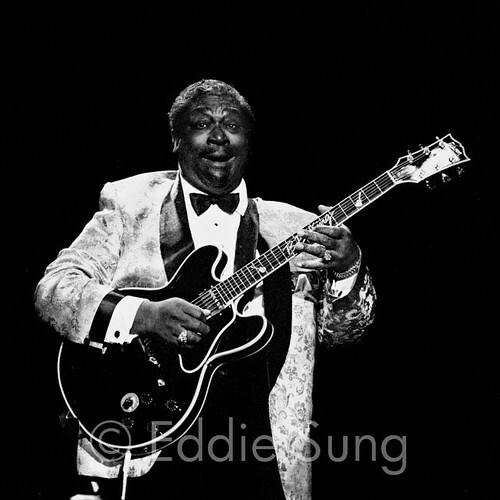 BB King is the guitarists’ guitarist. The Blues is in his blood. He’s the guitarist every legendary guitarist looked up to. They say if BB King played till a ripe old age of 90, so should they. BB King’s set the benchmark! 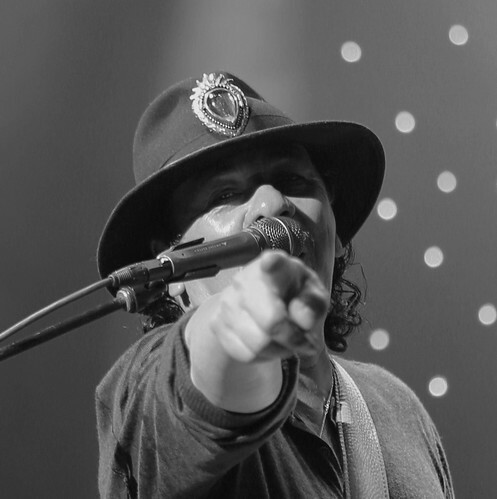 A much respected blues guitarist, he has influenced guitarists like Jimi Hendrix, Eric Clapton, Keith Richards, Jeff Beck, Stevie Ray Vaughan and John Mayer, etc. 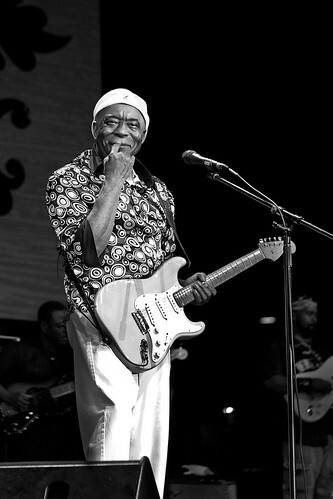 Still strutting his stuff at 81 years young, Buddy Guy never seems to age. I’ve shot Carlos many times whenever he comes to Singapore. He feels comfortable with me shooting his whole concert, and at times checks to see if I’m still paying attention. 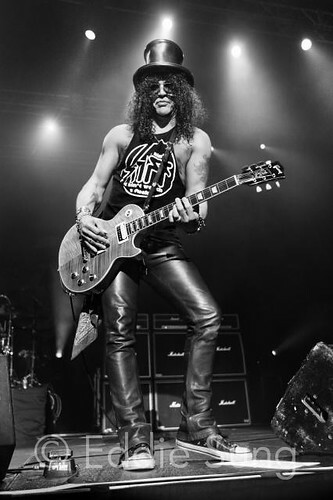 I’ve photographed Slash on a few occasions – at his solo tours, and most recently, at the phenomenal Guns N’ Roses concert. He is a visual delight to photograph. The master of the Sitar. A sitar is much harder to master than the guitar. During the psychedelic 60s, the sitar was keenly featured in bands’ albums. He taught George Harrison how to play it. The results can be heard on the song Within You, Without You on the Beatles’ Sgt Pepper’s album, which is celebrating its 50th anniversary since its release in 1967. 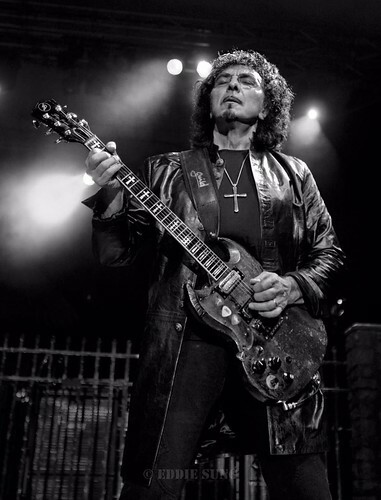 Like Keith Richards’ guitar defining the Rolling Stones sound, Tony’s low & heavy guitar riffs define the trademark menacing Black Sabbath sound. 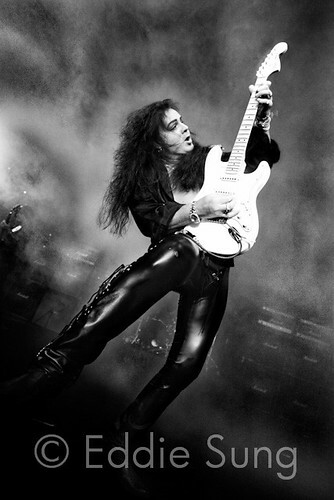 Swedish Yngwie is known for his lightning speed neoclassical metal guitar mastery. I’ve shot Metallica twice. 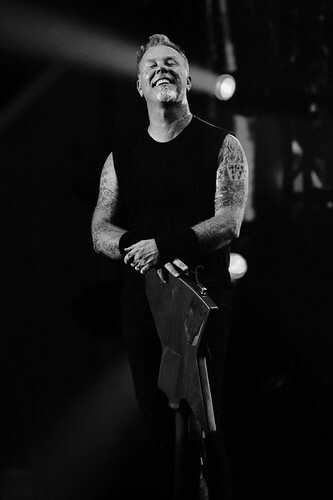 James was clearly elated about the massive fans’ reception of the band’s performance. His satisfied, relaxed smile showed this. 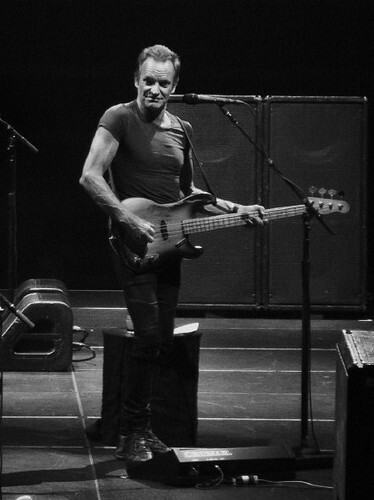 Although known to be a bassist, he plays it like a lead instrument. He also plays the guitar from time to time. The lead guitarist for the heavy metal band Metallica. Besides surfing, he collects holy-grail horror memorabilia! Cool awesome dude! 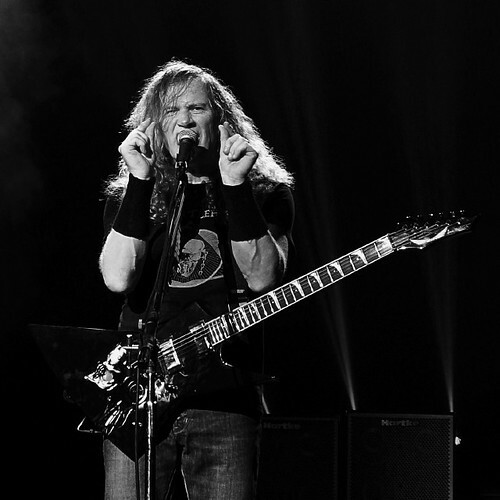 Once part of Metallica, he co-founded thrash metal band Megadeth and took it to great heights. Bonnie is the undisputed Queen of the Slide Guitar. 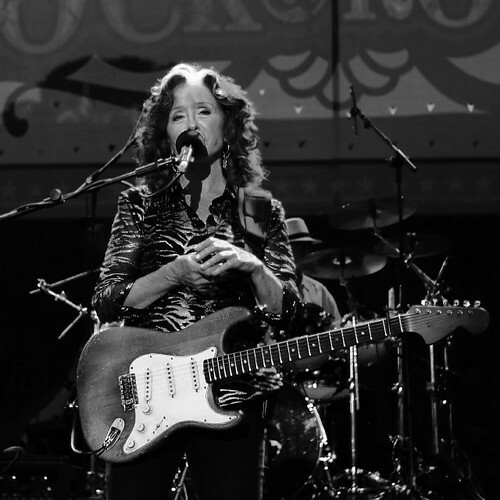 Her roots-influenced albums incorporated blues, folk, rock and country songs. She is also a tireless activist of political, environmental, anti-nuclear and music campaigns. A genuine Joe Cool, this guitar virtuoso taught Kirk Hammett (Metallica) and Steve Vai how to play guitar! Wow! I love his ground-breaking Surfing With The Alien album. He even joined Deep Purple briefly. Oh, and he married a Singaporean – Rubina! Swee! The Viking with a Flying V! Zakk gives his 150% playing for his fans. 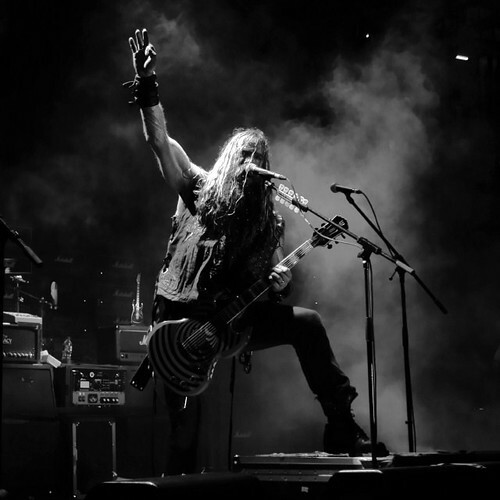 He is known for being the guitarist for Ozzy Osbourne and founder of heavy metal band Black Label Society. He likes to go down to the barricades and mingle with his fans whilst playing his guitar – with his teeth, his tongue, behind his head etc. To me, guitar prodigy Steve played with Frank Zappa! Period. A most humble and good natured man. 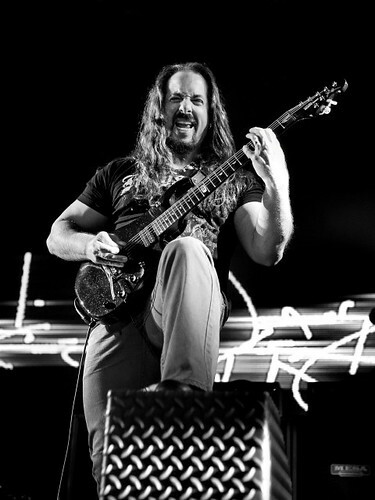 Top ranking guitar maestro, John provides the elaborate fret work to the progressive metal band Dream Theater soundscape. tone, this mild-mannered guitar genius took about two hours for soundcheck. Respect! 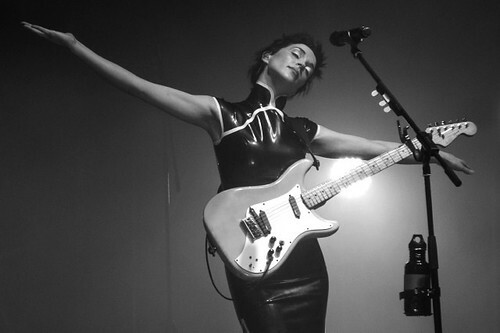 Aka Annie Clark, she’s known for her electropop, soft rock , experimental rock and jazz musical styles. 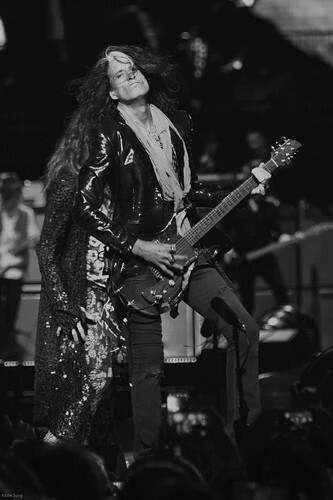 The lead guitarist of Aerosmith. He and frontman Steve Tyler form the Toxic Twins, due to their toxic intake of drugs and mind-altering beverages. A co-founder of thrash metal band Slayer. This image was captured during soundcheck. 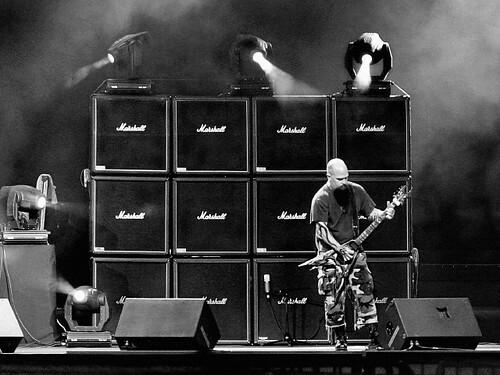 Just Kerry and his Marshall stacks! What a glorious sight to behold. A quick snap of the camera, and lightning is bottled! 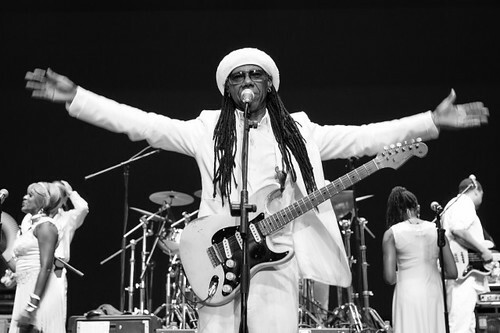 An accomplished song writer, arranger and producer (David Bowie, Madonna Sister Sledge , Duran Duran etc), Nile is famous for his “chucking” rhythm guitar style. He also co-founded the legendary disco group Chic. 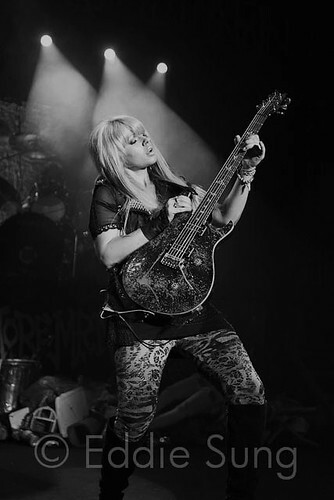 This gifted Australian guitarist has played with Michael Jackson and Alice Cooper. Kudos! This Portuguese is the lead guitar maestro for the band Extreme. His fret work on the hit song “More Than Words” is timeless. I count myself super lucky to have witnessed some of the World’s Greatest Axe Men! I thank some of them for letting me and my camera into their Inner Sanctum. And others, visiting my Inner Sanctum (home and gallery).